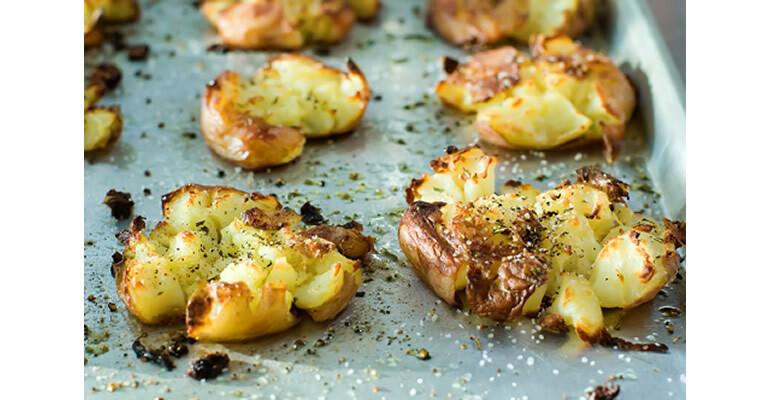 Pioneer Woman’s hot crash potatoes | Pioneer Woman’s hot crash potatoes – oh, that's tasty! I think this is the recipe that was my portal into PW’s blog. 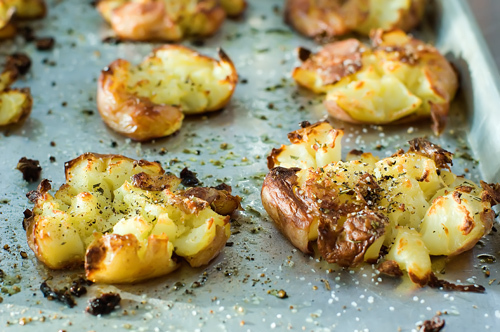 Red potatoes are boiled till tender, then coarsely smashed on a cookie sheet, drizzled with olive oil, seasoned with rosemary, salt and pepper, then baked briefly at high heat so they come out golden brown and crunchy around the edges. The thing that makes or breaks this dish is getting the salt right. I was a little too shy with the salt the first time; a mistake I won’t make again. By the way… Did you know that new (aka, red) potatoes are lower on the glycemic index than baking potatoes? And that boiling them keeps them lower than baking? Boiled new potatoes rank in the mid-50’s; baked potatoes, 85. Also, cooking certain starches — potatoes among them — then chilling them lowers their glycemic index even more, and converts the starch to resistant starch, which is digested differently and may have health benefits for insulin sensitivity and other markers. (More info here.) I bet you could boil these ahead of time, chill them, then prep and roast just before serving.